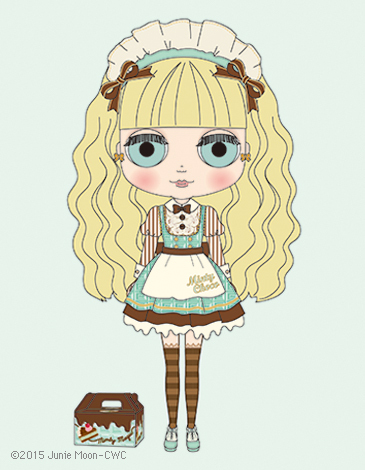 One of the Blythe January's realises has been reveal, we know her name is Minty Magic and she works at a chocolate cafe with the most delicious chocolate drinks and the cutest uniforms! The delicious chocolate paired with vanilla cream and mint is a winning combination. Minty Magic works at the super popular Mint Choco Café. Her uniform resembles all the best ingredients for an awesome dessert, chocolate, vanilla for her dress and mint with her pinafore apron. The logo for the café is embroidered on the apron. She also wears a frilly head band, bordered knee-high socks, and a minty pair of boots. The collar, cuffs, ribbon, buttons, and skirt hem are decorated with a whipped cream motif. Her facetype is Radiance+, and her face color is cream. Her hair is blonde, and cut short at the bangs. Her eyeshadow is brown, and her eye lashes are a default brown. Her cheeks and lips are a salmon pink. Her special eye chips are mint green, and brown for the front and left facing eyes, respectively. The illustration is a concept and does not represent the final product.